Every company has a story of how it started and why it started. The motivation to make things happen. Sunbank is no different. 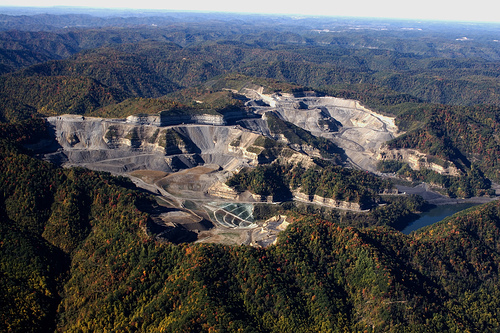 The Sunbank’s story starts in an unlikely place, the coalfields of West Virginia. I grew up surrounded by verdant hills and people working hard to extract coal from them. I tended to appreciate the hills more for their trails to walk and cliffs to climb than the metric tonnage that could be extracted from them. I grew up watching steam billow from the cooling towers of power plants and wondering why I had asthma. I grew up surrounded by energy issues in a state that proudly “kept the lights on” and as a witness to the devastating price the people and environment in West Virginia pay for that pride. With that history as a backdrop, it’s no surprise that like many people these days, I see energy and climate change as being one of the key issues of our time. Previous generations had their issues and future generations will no doubt have theirs. This is ours. So I decided that I wanted to work in alternative energy and make a positive impact. This led me to another unlikely place, the Atlantic Coast of Nicaragua, where the idea for Sunbank Solar was born. In Bluefields, Nicaragua I volunteered for BlueEnergy for nine months in 2009. BlueEnergy is an non-governmental organization (NGO) with a different type of model: work with the local communities, get input and skip generations of fossil fuel burning technology that have polluted our world for the past several decades. BlueEnergy is in a unique position because it is working in many communities that don’t already have an electric grid. These are remote rural communities, that would have diesel powered generators if getting the fuel weren’t so expensive. There’s not a lot of coal in Nicaragua. What better opportunity for new technology and for alternative energy to take hold? This process, skipping generations of technology, has happened all over the world. Another example is cell phone technology, which has arrived to places all over Africa that never had land lines. It is an interesting paradox, that wealthy countries are actually held back in their adoption of new technology by the fact that they already have functional (yet obsolete) technology. 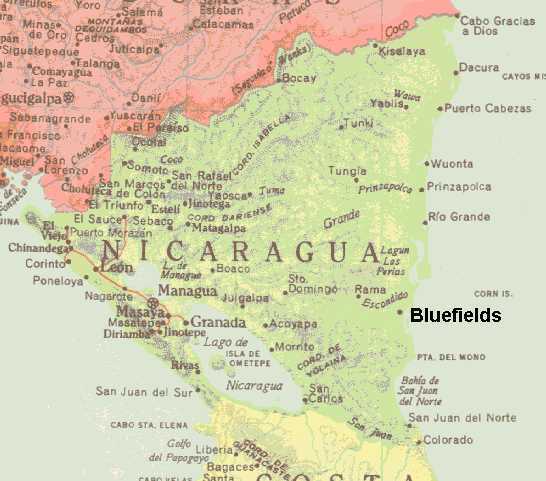 Bluefields, which is the region’s largest city, sits on Nicaragua’s famously remote Atlantic Coast. It’s so remote that there are no roads in or out. Your only choices for getting there are flying into the small airport or taking a speed boat for several hours down a river. This is also one of the most impoverished regions of the Western Hemisphere. While here I worked with fellow volunteers from all over the world including the USA, Mexico, Australia, Argentina, Israel and France on rural electrification and water purification projects. The volunteers and local staff at BlueEnergy build wind turbines with 14 foot blades, install solar panels and bio-sand water filtration systems, as well as explore new technology like the potential use of biogas stoves. When I was there, I wanted to investigate the efficacy of solar water heating. With a little bit of down time and lots of PVC piping, we designed, built and plumbed a thermosyphon solar water heating system for the volunteer housing. 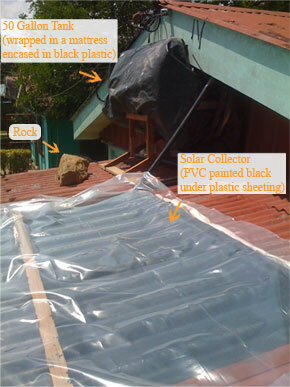 It is the simplest type of solar water heating systems; a passive design where PVC tubing painted black was fit into the corrugations of the metal roof. The water in these PVC tubes would heat up and create a natural convection loop (as heat rises) to circulate the cooler water into the collectors and the hot water into the tank. Although much higher technology and is available for use with municipal water systems in the US, The Sunbank uses many of these same principles in its passive design. This design feature, when compared to other types of solar water heaters, saves time and money. Passive solar water heaters eliminate the need for pumps therefore greatly, reducing maintenance issues and electricity consumption. Imagine not taking a hot shower for more than a year. This system was a gift for volunteers who had been in Bluefields for that long. 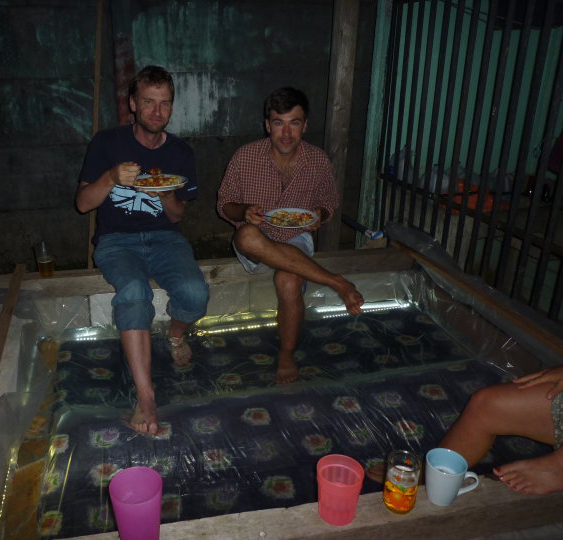 In fact, the system was such a hit that a solar hot tub made out of locally available materials like cinder blocks and old mattresses was built behind the house. With the success of this system came the obvious question: “why isn’t this everywhere?” That question led to lots of research on the topic of solar water heating and the answer was that in some sense, it is. Solar water heating is the standard way to heat water in much of the world and the only logical and affordable way for many people. In many places that never had electric or gas water heaters, just like cell phone they skipped the generation of old tech and went directly to solar water heaters. In other places, like Hawaii and Japan, the price of electricity is simply too expensive to not use solar water heaters. Exploring why solar water heating isn’t more popular in the US will be the topic of our next blog post. A big part of that answer, though, is that we stick with what we know. Plumbers stick with what they are comfortable installing and old tech tends to persist without a disruption. However, since 2011 Sunbanks have started to be installed all over the country. Those who have already found them and are taking solar showers have been very pleased. And thankfully, they have no plans of going back to burning coal or gas to heat their water.